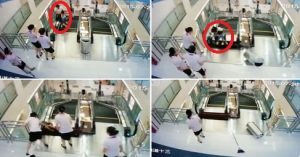 Security camera footage has emerged of a mother saving her young son’s life seconds before losing her own on an escalator in China. As the escalator in a shopping mall almost reaches the top, a woman in a white shirt and black skirt lifts up her young son to get ready to step off. But as she does, a metal panel collapses under her feet. She falls into the gap. The woman — identified in media reports as 30-year-old Xiang Liujuan. The footage shows that Xiang managed to push her son into the arms of shop attendants near the top of the escalator. The two women employees who are standing at the end of the elevator tried to drag Xiang out. They tried very hard to pull her out but she disappears through the hole into the escalator shaft. Frustrated with the mall’s handling of the situation, Xiang’s family members have gone online to call for a thorough and transparent investigation. “An ordinary Sunday shopping trip ended up in such a sudden tragedy, almost ruining an entire family,” said user @kkcake, who identified herself as Xiang’s sister-in-law.